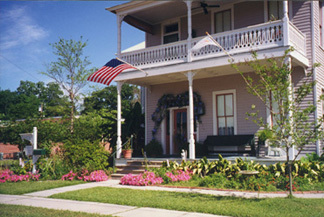 The home was built in 1892 by Emile Daboval, the sixth mayor of Rayne. In 1927, Mrs. Besse bought the property and it became the Besse Annex. Martha and Gene Royer, French Acadians native to Rayne, bought the home from Mrs. Besse in 1994. Gene, a talented residential painter and Martha, a tour guide for Louisiana have lovingly restored Maison Daboval to its original elegance and charm. During the restoration Gene and Martha found many discoveries about the home. One was the ledger Mrs. Besse kept during the 30's - 40's. This treasure reveals a slice of history about the boarding house days. In the tradition of Cajun hospitality, the Royers often share nostalgic stories of couples falling in love during the bygone era of the railroad boarding house. A passing train can set the mood for story telling on the front porch of Maison Daboval. Rayne’s unique history will inspire you to take a walking tour of the city to view the famous frog murals. Once a top exporter of frog legs, Rayne is known as the Frog Capital of the World. Maison Daboval has five beautiful rooms, decorated with antiques. Each room has a private bath and all have original claw-footed bathtubs. Every morning a full Cajun breakfast is served. English and French are spoken. Checks, Mastercard and Visa accepted. Martha and Gene Royer's home was featured on HGTV's "If Walls Could Talk." HGTV was inspired by the rich history of the home and the extensive renovation work done by Martha and Gene. The episode number is WCT-601.